Chosen by a group (never would have done this one on my own). 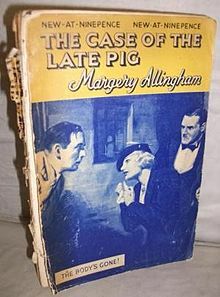 Allingham is an English author I’d never heard of before but would definitely have enjoyed in my Agatha Christie days. This book in the series of 9 was made into a BBC show. First, this is not a farm book, the “Pig” in the title is a person, a man who is not liked by his acquaintances because of his less than honorable dealings. No one likes him. Campion goes to his funeral in January because he seemed to have been invited by a strange note. Then the following June he is called to a murder scene at a men’s club and – huh? Pig has been murdered there and it turns out several of the other men had bad feelings toward him. Campion is getting notes from someone telling him there is more involved. His valet (or whatever) Lugg is disgusted that Campion gets involved at all but it was his friend Lou who called him about the murder. Poppy, the manager of the club also seems to be involved in some way, but she’s really kind of dim and sweet. The local minister seems to be around a bit too much. Hmmmm…. lol But everything is explained in the end. These books are old fashioned who-done-its of the British variety which were very popular and some (this series for one) are still in print. There is often a humorous element (probably all the books in this series) as well as a standard murder mystery full of foreshadowing and little twists and little twists right up to the end. They’re quick and enjoyable reads – I don’t know if I’ll actually follow the series – sometimes I do, sometimes not.